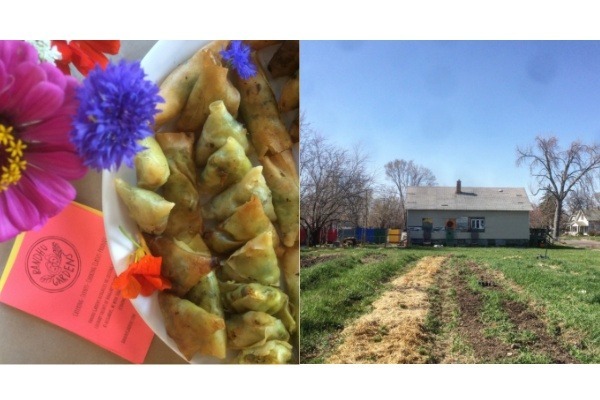 Bandhu Gardens is a cross-cultural and multi-generational project which recognizes the gardening and culinary talents of the Bangladeshi immigrant women in our neighborhood and connects them with economic opportunities through food work. We are co-led by Minara Begum and Emily Staugaitis. On Friday November 9, our Bandhu Gardens hub + kitchen space was broken into and thieves stole a lot of equipment that we had purchased or received as donations. The house belongs to me (Emily), an investment I made to create a permanent space for our community of neighbors, farmers, home cooks, and children to gather, work, explore, and create together. I had installed a security door, which the thieves broke down to take away our tools and equipment. I cannot afford to replace these items using my own funds, and I am looking for help to be able to re-purchase these needed supplies. As soon as possible! There are some end-of-season farm tasks we need to complete to have the garden ready for the spring, and to continue working on building out the house’s interior throughout the winter. Through Bandhu Gardens, since 2015, in addition to the gardening work, we’ve hosted hundreds of people through popups, catering, tours, and university student interns. Bandhu Gardens is about the broader connections we’re making through gardening and cooking. Your support to work through this financial setback will be essential to help us order to keep doing this work and to keep moving forward. Bandhu Gardens has been funded through my personal income as an educator, and countless volunteer hours from neighbors helping with graphic design, pop-up staffing, and garden work parties. I am so grateful for your interest in contributing financially to our community network. Thank you!